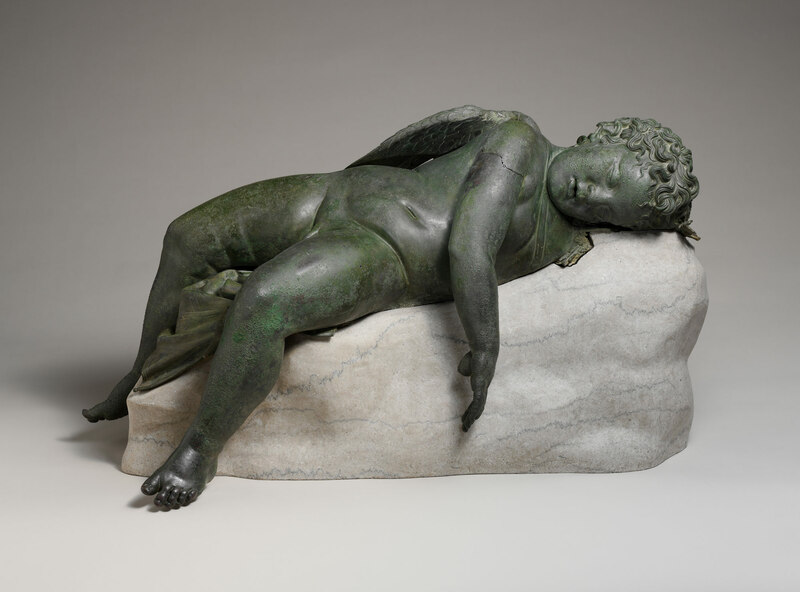 Greek statue entitled ‘Eros (Cupid) Sleeping’ from the 3rd-2nd century B.C. The month of February often conjures up the all too familiar images related to Valentine’s Day: heart-shaped chocolates and balloons, bouquets of flowers, and Hallmark cards passed between young children at school and between romantic partners. In the United States, Valentine’s Day is a day dedicated to celebrating love—often, to celebrate the state of being smitten. According to Merriam-Webster, smite originates from a twelfth century Middle English word meaning to smear or defile; the dictionary likens it to an Old High German word with a similar meaning. As it relates to romantic love, this definition is almost paradoxical. Perhaps “captivate” or “take” make sense (Merriam-Webster’s example sentence cites being captivated by a woman’s beauty), but for this word to also be defined by violence produces a fascinating contradiction: why are the two linked? To answer this question, we can look to another common Valentine’s Day symbol that stems from Greek and Roman mythology: the God of love, Cupid. Usually portrayed as a young and winged boy, Cupid is armed with a bow and arrow; anyone who is struck by one of his arrows, mortal or not, is overcome by affection and love. Cupid’s very existence takes into account both sides of smite’s definitions: the first being the gentle inspiration of love; the second being the violent mechanism by which love is inspired. In some depictions, he is wearing armor as he works to matchmake. This begs the question: does this interpretation fall into the softer definition of smite, suggesting that love is invincible or impenetrable? Or does it fall into the harsher one, likening love to war? It is important to dissociate from love the type of behavior displayed by Weinstein (and many, many others). However, it is equally important to remember the duality of smite’s definition, and to remember Cupid’s bow and arrow, and armor when thinking about love and relationships as they exist today, particularly in the context of the MeToo movement. Those in positions of power have been forced to confront the issue of accountability, some for the first time, and these considerations will then hopefully trickle down into more of an awareness when it comes to fair and healthy relationships. When one is smitten, one is, according to the word’s definition, “deeply affected” by feelings. It is imperative to take into account the depth of this impact. As the language suggests, relationships—and love—hold great power. This entry was posted in Cover, Current Articles, Word of the Month by Sarah Baker. Bookmark the permalink.